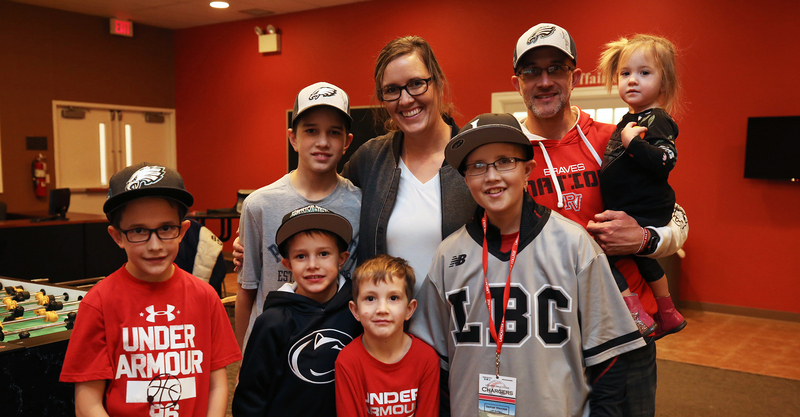 In May of 2014, when Damien Smucker was just 10 years old, doctors found a softball-sized tumor in his brain. In the 48 hours following the discovery of the tumor, the young boy underwent two emergency surgeries. Doctors discovered the tumor was cancerous and Damien was diagnosed with a rare type of brain cancer called primitive neuroectodermal tumours (PNET). “When he came out of surgery, the neuro-surgeon said Damien may never walk or talk again,” said Damien’s father, John Smucker. Above: Members of the LBC baseball team great the guest of honor in the gymnasium lobby. 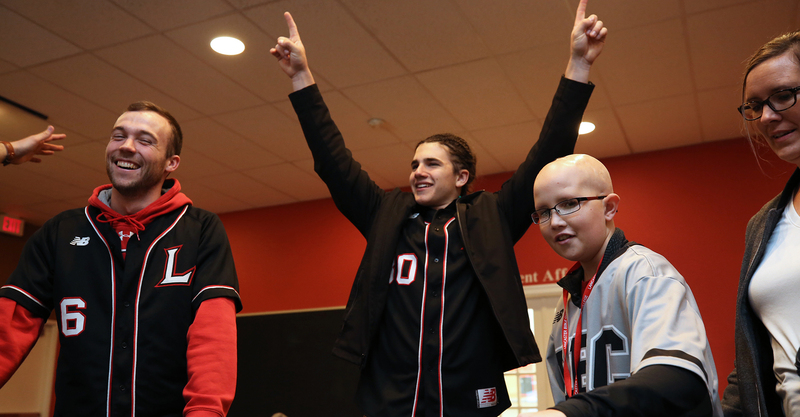 Above: Following the ceremony, Damien and the team played games in the student lounge. In short, Damien’s life is a miracle. A life-long fan of baseball – he started playing on a Little League team at age 6 – Damien had to quit his favorite sport once the cancer began to spread and affected the right side of his body. While he’s not able to play on the field any more, his mom says he’s still just as passionate about America’s favorite pastime. He now cheers on his siblings and favorite professional teams from the stands. “Damien is his brothers’ biggest and loudest fan at every game,” said Suz with a smile. 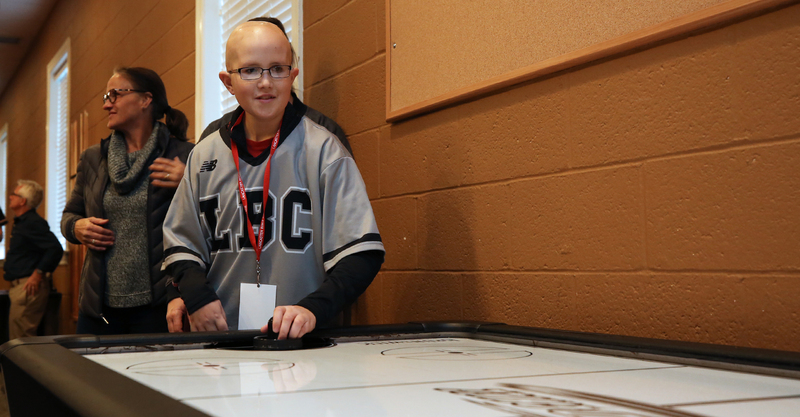 Above: Damien plays a game of air hockey with one of the members of the baseball team, donning his new jersey. 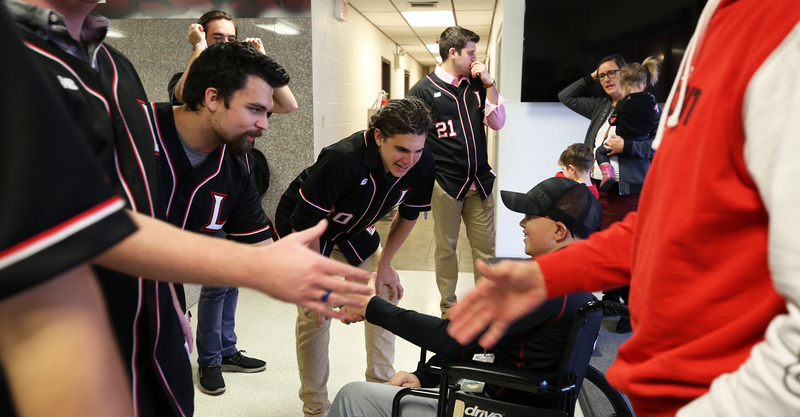 To bring a bit of cheer to Damien and his family, Lancaster Bible College’s baseball team held a special ceremony for the young baseball fan. During the event, he signed a letter of intent to play baseball for the Chargers, received a customized jersey and an official press pass. A wide, shy smile spread across Damien’s face as he inked his John Hancock on the letter, surrounded by the entire team who cheered him on. Above: The Smucker family pauses for a portrait. Want to learn more about our athletic programs?